By Jennifer Burcke on November 13, 2012 Visit Jennifer's Website. every day that passes on the calendar. I find it more difficult to embrace fall and the resulting winter season each year. I understand that the purpose of these seasons is to allow our farm and its inhabitants to rest and regain our strength for another growing season next spring and summer. I understand, but I still find it hard to accept. Our flock is more tolerant of fall’s arrival. They accept the fewer hours of daylight and cooler temperatures. They don’t protest when I close up the coop for the night at 5:00pm. As far as I know, they don’t bemoan the fact that bedtime is now almost three hours earlier than it was during the summer months. Last year, they did join me in mourning the loss of something very dear to all of us here at 1840 Farm. With cooler temperatures and shorter days, the bounty of fresh produce from our heirloom vegetable garden came to a screeching halt. 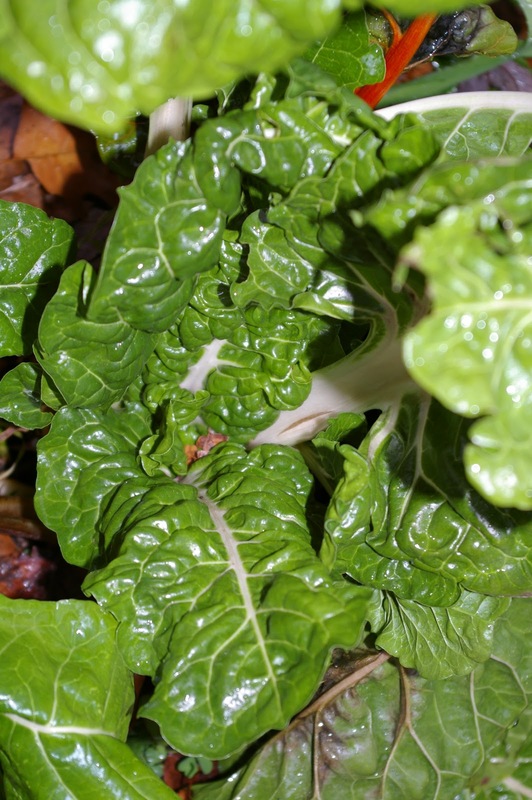 There were no more meals for me to create using seasonal swiss chard, onions, and other frost hardy vegetables. There were also no more deliveries of fresh garden goods to the heritage breed hens living in our coop. During the gardening season, we share our fresh produce and accompanying weeds with our hens. 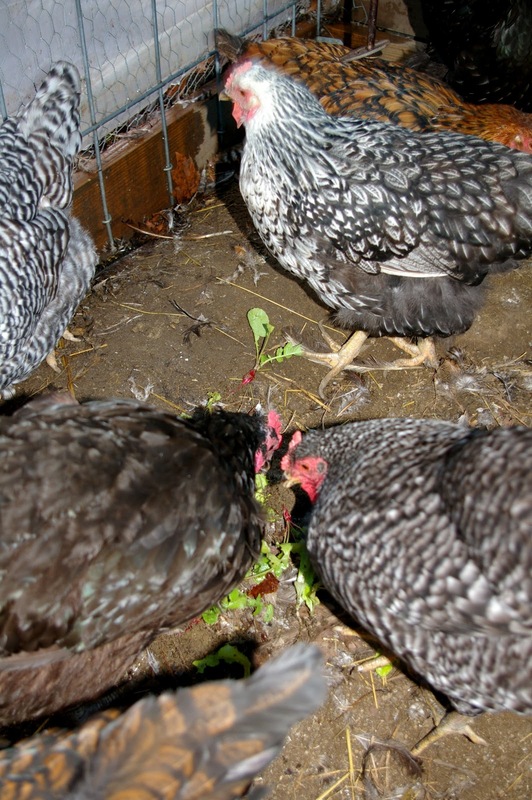 The girls have come to expect that we will visit the coop with fresh weeds, greens, vegetables, and berries from the garden. In fact, they come running to the door, eager to be the first in line to survey the fresh buffet of treats. Notice that I mentioned that our hens were unhappy about their lack of fresh garden produce last fall. This year, they have been enjoying a steady stream of greens fresh from our raised bed garden. Most of the garden has been put to bed for the season, but three beds are still producing delicious greens and root vegetables under their protective blanket of leaf mulch. We have been enjoying unseasonably warm weather here in New England this fall. It was well over sixty degrees here at 1840 Farm yesterday. It felt much more like September than November. I enjoyed every minute of it. The warm weather has allowed us an extended growing season for a few cold hardy crops. We are still enjoying fresh swiss chard, radishes, and herbs on our dinner plates. Luckily for the hens, that means that they are still enjoying swiss chard stems, radish greens, and their favorite herbs in the coop. In addition to the garden crops that are still growing in the raised beds, we also have a row of greens that were grown specifically for the hens living in our coop. The row of greens sown from a package of My Pet Chicken’s Chicken Salad Seed Mix was always destined to be used as treats for our flock. These greens were grown with our hens in mind. They were planted earlier this fall and have flourished in the garden beds. Each day, I choose a handful of greens to take to the coop. The hens happily greet me at the door and devour the bright green leaves. The turnip tops and clover flowers are the most popular. In a matter of moments, they have devoured the day’s offering and returned to their routine activities within the run. I know that it won’t be long before the temperatures and accompanying snow will bring an end to our growing season. Then it will be time for me to bring steaming bowls of warm oatmeal to the coop each morning instead of leafy greens. The hens and I will have to be content to count the days until next spring arrives and we can return to enjoying our garden fresh produce. I do have an early spring surprise in store for them. I have sown a row of Chicken Salad Seed Mix under a thick bed of leaf mulch in one of the raised beds. As soon as the spring sun has warmed the ground enough to allow the seeds to germinate, they will begin to produce delicious and healthy greens for our flock. I can’t wait to see those first sprouts emerge from the soil in the raised beds. Seeing the green sprouts will signal that spring has come to 1840 Farm! 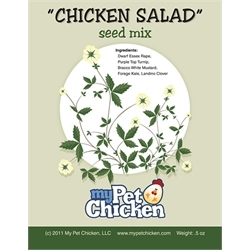 Would you like to win a package of My Pet Chicken’s Chicken Salad Seed Mix? Visit 1840 Farm to enter. I will randomly select one lucky winner and announce them in my next post. Congratulations to Susan who was selected as the winner of her own package of Chicken Salad Seed Mix. I hope that her flock will enjoy their fresh greens as much as mine have! Follow us on Facebook to read the daily news from the coop.